was the name Al Larson earned when, torn away from the midst of the firefight in Vietnam and catapulted to a time and place where the Norse gods fought a deadly war of their own, he was instrumental in the death of Loki, a key lord of Chaos. But now Larson, the master swordsman Gaelinar. and the elusive thief known as the Shadow Climber were about to embark on an even more desperate quest. For the balance between Chaos and Law had been all but lost. Fenris Wolf stalked the lands of men, thirsting to drink the lifeblood of Larson and Gaelinar, while Hel herself sought vengeance for Loki's destruction. 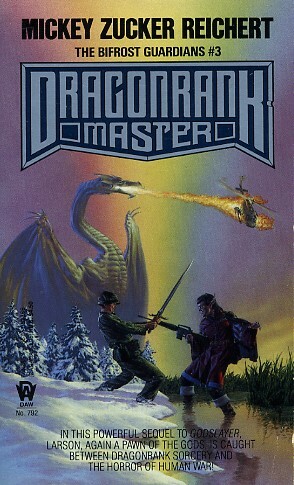 Pursued by these foes out of nightmare, could Larson and the others survive long enough to recover the one hope of the forces of Law--the legendary rod of Geirmagnus, the first Dragonrank mage--a mission that would take them from the citadel of Dragonrank powers to war-torn Vietnam to Hel's dark realm and beyond?